On September 29, Oleg Z. Zaleski, an 18-year veteran with the U.S. Customs Service, died of heart failure at the age of 80 at St. Joseph’s Hospital in Atlanta, Georgia. Although few at Customs may be aware of it today, Zaleski was single-handedly responsible for what is now one of our most visible traditions: the continuous display of the United States flag at our 24-hour ports of entry. 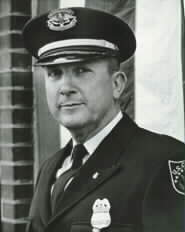 Zaleski entered Customs in 1961 as a Inspector at the Detroit port of entry, eventually attaining the rank of Senior Inspector. While on duty late one night, Zaleski, a first-generation Polish-American, noticed the empty flagpole, and it bothered him. "He was very patriotic," recalls Anita Weinraub, one of Zaleski’s two daughters. "He felt it was important that Americans returning home, as well as immigrants coming here for the first time, be able to see our flag on display, whatever the hour." Never shy about standing up for what he thought was right, Zaleski made an official suggestion to change the policy, but it was turned down. In fact, his daughter recalls, he resubmitted his idea several times, and each time it was rejected. But Zaleski’s strong belief in the need to honor our country’s flag led him to continue his crusade. Eventually, in 1972, Zaleski’s suggestion was formally approved. What’s more, the recommendation caught the attention of the White House. 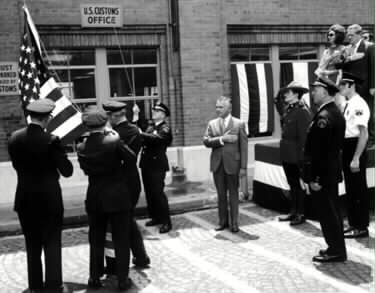 To celebrate the change in policy, President Richard Nixon issued a Presidential Proclamation which read in part, "the flag of the United States of America shall hereafter be displayed at all times during the day and night, except when the weather is inclement, at United States Customs ports of entry which are continually open." In a Flag Day ceremony at the Detroit-Canada Tunnel, Zaleski himself hoisted Old Glory, joined by Commissioner Vernon D. Acree and other dignitaries. While Zaleski’s role in changing Customs’ policy is perhaps his most visible legacy today, it is not the only distinguishing aspect of his life. Zaleski also had a knack for being in the right place at the right time to meet some of the 20th century’s most famous individuals. In 1929, the nine-year old Zaleski attended the dedication of the Edison Illuminated Fountain in Detroit and, to get a better view, he hid beneath the grandstand. A policeman noticed him, and was hauling him away when several dignitaries invited the boy up onto the stage. That day, Oleg Zaleski shook hands with Thomas Edison, Henry Ford, and Harvey Firestone. After graduating from high school in 1937, Zaleski joined the Army, where his leadership abilities led his superiors to recommend him for Officers Candidate School. During World War II, Zaleski served in the New Hebrides, Guadalcanal, Papua New Guinea, and the Philippines. One of his duties was to work with the USO, and on several occasions the young officer found himself dining with such stars as Bob Hope, Jack Benny, and others. Zaleski remained in the military through the Korean conflict and retired in 1958 with the rank of Lieutenant Colonel. In 1961, Zaleski met a Customs employee who suggested he consider taking the U.S. Customs examination. Zaleski was soon wearing a new uniform, as a Customs inspector in the Detroit Port of Entry. In the course of his Customs duties, Zaleski’s talent for being in the right place allowed him to meet and even become acquainted with yet more of the century’s famous figures, including Henry Ford II and Lee Iacocca. For Anita Weinraub, the most memorable of these encounters was the time he met the Beatles when they visited Detroit in 1965. What compelled Zaleski in his crusade to change the Customs policy on nighttime flag display? Certainly his sense of honor and patriotism played a part. But in addition, Zaleski had another quality in abundance: perseverance. Zaleski’s wife of 59 years, Helen Kulinski Zaleski, tells a story that illustrates the point. In 1932, Zaleski’s father, like millions of other Americans, was out of work. Acting on his own, young Zaleski walked into a local tool and die shop, somehow made it past the receptionist to the owner’s office, and began to explain his father’s situation. The owner stopped him and offered a dollar to help his family. The forthright young boy politely responded that he didn’t want the man’s money — he simply wanted him to give his father a job. Not surprisingly for any who ever worked with him, Zaleski’s gambit succeeded: the owner hired his father on the spot, sight unseen. In addition to his wife and daughters, Zaleski is survived by three grandchildren. Oleg Zaleski was buried with full military honors in Arlington National Cemetery. Detroit-Canada Tunnel, with Commissioner Vernon D. Acree standing to the right.